Värmland borders on Dalsland in the south and on Dalarna in the north. Foreign tourists usually only come to Värmland during the summer, but the Swedes are also fond of Värmland in the winter. They love to come here for skiing, for example in the child-friendly ski resort of Branäs in the north of Värmland. Karlstad is the centre of Värmland. The city is situated on the northern shore of the great Lake Vänern and is home to around 60,000 people. In Sweden we like to associate the successful hockey club Färjestads BK and the coffee brand Löfbergs Lila with Karlstad (Swedish coffee is always recommended as a souvenir). Värmland has an additional 250,000 inhabitants spread over 17 municipalities: Arvika, Degerfors, Eda, Filipstad, Forshaga, Grums, Hagfors, Hammar, Karlskoga, Kil, Kristinehamn, Munkfors, Storfors, Sunne, Säffle, Torsby, and Årjäng. Värmland is about 250 kilometers long, stretching from the shores of Lake Vänern in the south, where one finds an archipelago and the town of Kristinehamn, to the northern mountainous area. 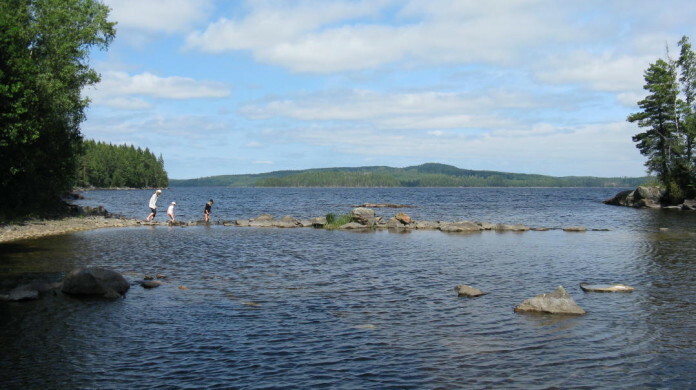 In between there are more than 10,000 lakes, the river Klarälven and, of course, huge forests. For nature lovers and outdoor activities there is a wealth of options: You can collect mushrooms and berries, enjoy a moose or beaver safari, go fishing, hunting, hiking, canoeing, rafting, or cross-country skiing (even in the summer, in the Torsby ski tunnel) or you could simply relax in the sun and swim in the lakes. Värmland has preserved its traditions and history in over 200 local museums, which are called “hembydgsgårdar”. Many of them are open daily in the summer and have events with music, dance, exhibitions and theatre performances. Often, there are also cafés where you can taste homemade local bread and cakes. Every year in the museum of Brunskog the old Sweden is celebrated. This event is called “Gammelvala” and goes on for a whole week. In Arvika we liked the linen weavers Klässbol, where you can watch the production, buy a present in the shop and enjoy the café. The telephone museum with the first phones from LM Ericsson, the founder of the modern global corporation, is worth a visit in Grums. In Sunne you can enjoy the beautiful gardens of Rottneros Park, and in Hagfors the local folklore museum Kärnåsens Hembygdsgård.